Make speaker wires disappear right on the wall or under the carpet with Sewell Adhesive Speaker Wire. 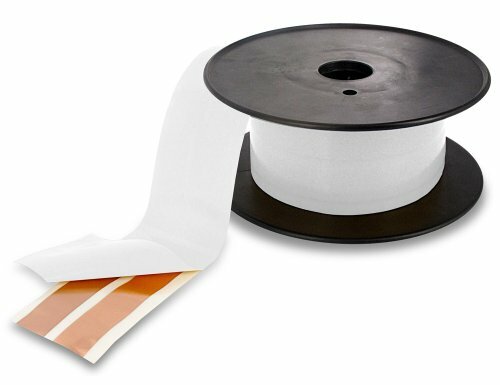 This super flat speaker wire can be used on almost any flat surface. Perfect for running stereo signals across rooms, around corners, in automobiles, under flooring, or any situation where wires cannot be run through walls. White backing allows wires to be simply attached and left uncovered, or it can be easily covered with paint, wall paper, or flooring making the wire virtually invisible. Easy stick on installation saves you from the difficult task of pulling wires through walls or attics. Simply peel back the yellow adhesive covering and stick the industrial strength self-adhesive side wherever you want it. No screwdrivers, hammers, or jigsaws required. Impress your friends with this premium speaker wire!